Red Falcon has invaded the Earth again, this time brainwashing the military. It’s just another day at the office then for Bill Rizer and Lance Bean, who rock ‘n’ load a second time to fight the evil alien menace in Super Contra (1988). With Naoto Shibata at lead guitar, you gotta crank the speakers. The original was composed by Kazuki Muraoka (Metal Gear series) and Motoaki Furukawa (Gradius II, Dracula X: Rondo of Blood), who made that classic Konami arcade sound. This mix appears only on Konami Battle the Best (1996), a compilation and remastering of some of Shibata’s best work, along with a couple original tracks from Super Contra. “What Is This Place?” is perfect 80s rock. It’s got everything that’s right about America, from freedom and muscle cars to pre-steroids baseball and big guns. Trust me, it’s all here in this song, which I think may be the best Konami Battle mix Naoto Shibata did. The long notes punctuated by percussion explosions make this particularly memorable, and also follow the drudge of ‘back to the battlefield’ for a virtuous videogame war that seems endless (which keeps our thumbs and brains happy). All the instruments have excellent recording here, especially the drums and cymbal crashing (there’s some nice drums at 1:12). Shibata adds a kickass guitar solo at 1:25 that lasts about a minute before smoothly transitioning back into the main theme. The original version is really cool as well, particularly with the voice-over intro, monsters, and explosion. This hands-down makes this one of the coolest game intros ever. If you haven’t seen it yet, you deserve to watch it right now. Ronald Reagan would be proud. Explosive drum beats, blaring trumpets, and rockin’ guitar synths make for true dramatics. Those opening notes are immediately recognizable and a sure attention-grabber. This medley is from Contra Spirits (1992) and contains “Thunder Landing”, the stage one theme. This is a very intense guitar-driven piece with some nice string synths. Stands its ground well against the original Contra theme. There’s also “Great Heli-Ruined Base”, a nice, intense boss theme that was reused in Contra 4. The whole soundtrack was released in Music from Super Contra & A-Jax (1988) and has more mixes. If you check it out, be sure to listen to “Jungle Juncture” which is a hilariously awesome jungle rhythm. (Incidentally, though the NES did not have as good a sound chip as the arcades, they managed to replicate some of the trademark string and percussion bursts from the original in Super C). “Prelude of Legend” is the main theme from Gradius III (1990). Naoto Shibata’s version from Konami Shooting Battle II (1995) is my favorite as it captures the feel of late ’80s/early ’90s arcade games perfectly. The theme is very bold and the synth lead is very strong, which takes you to the roots of what videogames of that time were about: getting the player immediately absorbed into the gameplay and winning through skill and perseverance. “Prelude of Legend” thus trumps up the glory behind those heroic ideals, and it also has the glory of the Gradius series behind it as an opening to a classic shooter. For me, it also gives the sense of wonder that arcades had, with the dim lights, screaming sound boards, flashing screens, and this kind of dirty, dusty feeling that the rooms had. All of this is encompassed within this song. 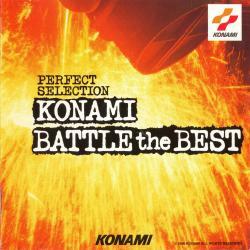 Perfect Selection Konami Shooting Battle II isn’t as good as the first album, which I think had stronger pieces, but this version works better as an opening theme. Still, all albums in the Battle series have many excellent tracks. Incidentally, a different version than what plays on Perfect Selection Konami Shooting Battle I, which is slightly slower-paced and contains a lot of SFX from the game. The Konami Battle series of rock mixes were arranged by Naoto Shibata, and again, all instruments are live performed (including keyboards). Gradius III‘s original composers were Kazuki Muraoka, Kazuhiko Uehara, Harumi Ueko & Yukie Morimoto. Ok, aside from having a slightly humorous title, Perfect Selection Snatcher Battle (1995) is actually a pretty cool soundtrack. While not the best in the Perfect Selection series, it has a few really great tracks, and “Difficult Move” is one of them. 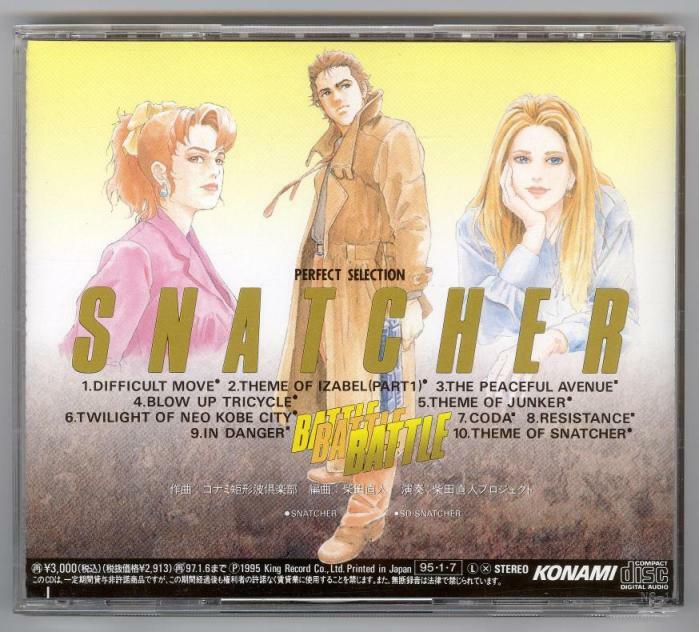 Snatcher Battle, like the rest of the Battle series, is a set of (mostly) rock mixes from classic Konami games. These have pretty high production, and many of the compositions still stand strong even 15 years after they were made. “Difficult Move” is a great way to begin the album, with strong major chords and a steady beat, giving the sense of the game’s private detective’s feet eating up the sidewalk. This particular song comes originally from SD Snatcher (MSX 2, 1990). Snatcher is a cyberpunk adventure designed by Metal Gear Solid creator Hideo Kojima. The game borrows heavily from Blade Runner/Do Androids Dream of Electric Sheep? Read the rest of this entry ?